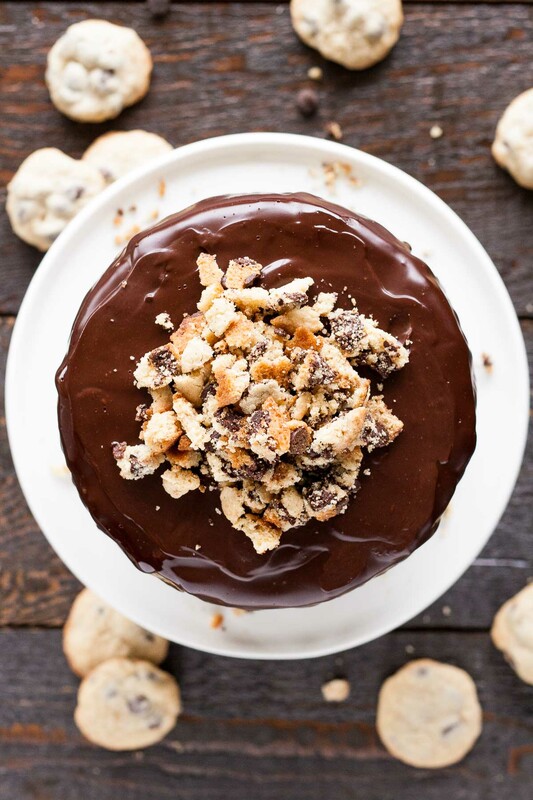 Combine classic chocolate cake with your favourite guilty pleasure in this Cookie Dough Cake! You’re going to think I’m crazy. Most of my friends and family already do, so I may as well let the cat out of the bag… I hate the way this Cookie Dough Cake turned out. Flavour-wise, it’s perfect; aesthetically, not so much. This is not what it was supposed to look like! Or rather, it was supposed to be less messy looking. You’re rolling your eyes at me already, I can tell. That’s ok, I fully embrace my craziness. I’d been wanting to do a cookie dough frosting for some time now, and thought it would pair perfectly with my chocolate cake recipe. If you haven’t tried this chocolate cake, you need to. It’s a really easy recipe and makes the fudgiest cake. I used my favourite chocolate chip cookie recipe for the frosting, except I swapped out the eggs for milk and left out the baking soda. I use the term “frosting” lightly. It’s basically cookie dough whipped into oblivion. You could add more milk to make it even lighter if you prefer. Frosting this Cookie Dough Cake was pretty straightforward, except for my spatula getting snagged on the chocolate chips here and there. The top part gave me the most trouble. I wanted to add a top layer of frosting to have the same number of frosting layers as cake layers, but that top layer was especially a pain to get flat and perfect. So, it isn’t. It’s kinda rounded and lopsided, and not really what I wanted. And because the top edges aren’t exactly crisp, the drips turned out less than perfect. They’re like, too evenly spaced or something. I can’t quite put my finger on it, but something’s off, and I don’t like it. I can feel you rolling your eyes. At some point the cake decided it would be fun to start tilting to the side too, so that was great. I had to try to nudge it straight and rotate it so that it looked even. Pics have been taken from the most flattering angle. The beauty of naked cakes is that they’re super easy to decorate because they’re supposed to look more rustic and imperfect. This is a great technique if you’re worried about your cake frosting skills! Cake decorating “issues” aside, I love the way this Cookie Dough Cake tastes!! If you’re a cookie dough lover (and really, why wouldn’t you be) you will love this frosting. 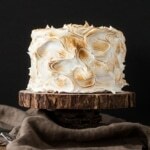 It goes really well with the chocolate cake, but would go great with a classic vanilla cake too. The chocolate drips add another hit of chocolate and some flare. Topped off with some crumbled chocolate chip cookies for some crunch. You can use hot water instead of hot coffee in the cake batter. The coffee helps to enhance the chocolate flavour, but it tastes just as good using hot water instead. To help ensure your cake layers bake up nice and flat, see my tips here. You will have some cookie dough frosting left over. I recommend making Cookie Dough Truffles with the excess. Chocolate Chip Cookie recipe here! 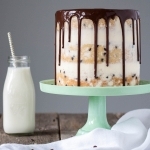 Combining classic chocolate cake with your favourite guilty pleasure in this Cookie Dough Cake! Beat butter until creamy, add sugars and beat on high until pale and fluffy (approx. 2-3mins). Add vanilla and mix until combined. Reduce speed to low and slowly add in flour mixture. Mix until just incorporated. Slowly pour in milk. Increase speed to med-high and beat for 2-3 minutes until light and fluffy. Stir in chocolate chips. Place one layer of cake on a cake stand or serving dish. Top with about 2/3 cup buttercream. Repeat with remaining layers. Smooth the outside, chill for 30mins. Using a teaspoon, drip ganache along the edges then fill in the top. Chill for 15mins. Top with chopped cookies if desired. Note: You will have some cookie dough frosting left over. 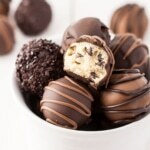 I recommend making Cookie Dough Truffles with the excess. Chocolate Chip Cookie recipe here! I am going to make this in (4) 8 inch pans so I switched the servings to 24. What would you switch the baking time to? Thanks! Hi Lauren! Yes, the baking time may need to be adjusted as well. It should be fairly close though! I love the look of this recipe! I am actually wanting to make it, and your Milk and Cookies cake recipe, for my daughter’s Cookie Monster themed first birthday party! I was hoping to make one of the cakes the bottom tier and one of them the top, with no preference on which. I am just not sure how to adjust the recipe to make them the same height with the same number of layers? 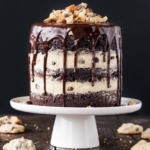 I figured the top layer I would stick with the six inch to make my life a little bit easier, but I have no idea what size I would make the bottom tier, or how I would adjust the recipe so the bottom tier has same height/number of layers? The party will have between 20-35 people there, but since this is centerpiece of a massive dessert table I’m not to worried about hitting that 35 serving size number. Hi Sheridan! Converting pan sizes is always tricky. Here’s a site I use as a guideline: http://www.joyofbaking.com/PanSizes.html If you do the top layer 6″ I would do an 8″ on the bottom. 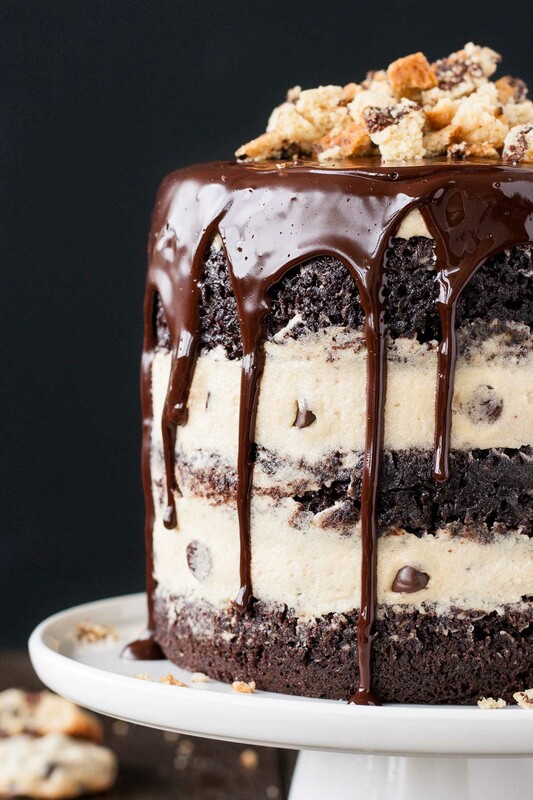 Hello, I want to make this tomorrow for my daughters birthday… however we need to feed 7 people. Can I double the recipe and then use 3 or 4 8 inch pans? Or what would you recommend? And can I double every ingredient or would I need some other calculation of measurements? Made this cake today for my birthday! I used my cookie dough scoop for the filling. Covered each layer with cookie dough balls and then gently smoothed them with my frosting spatula. Worked very well! Thanks for the fantastic recipe. Great tip Beth! Love that. Happy belated birthday! how many pans do you use for the cake and what are the measurements? This is my son’s favorite birthday cake frosting–he is a cookie dough fanatic. I’ve been making it at his request for the last three years. First year, I decorated it with chocolate chips in a spiral; last year just naked with no ganache; this year, I’m using melted chocolate and a Star Wars Tie Fighter stencil to change it up a bit. I could just eat the frosting without the cake, frankly! So. Good. Wow! 3 years in a row! That is high praise. And omg I LOVE the theme this year! I am a HUGE Star Wars fan. Take a pic and email it to me, I’d love to see! First of all, I had my husband read the first part of this, and he laughed and said it sounded just like me. I would have nit picked at the cookie dough layer too! Second, this was amazing! My son just turned 8 and has an unhealthy obsession with cookie dough. (I have no idea where he got that😜.) This cake was perfect for him! Hi there, beautiful cake and would like to maKe it for my daughters birthday, can you freeze this cake? Would like to make in advance. Hi Jenn! Yes, the individual components or the completed cake can be frozen. The exception is the ganache drip. I would do that post thawing. Be sure to wrap it well so that the sides of the cake don’t dry out. Hi Joyce! It’s so that the cake and frosting can soften up and come to room temperature. It’s best served at room temp! What will happen in case I replace coffee with hot water? My husband just got me a stand mixer and this was my first try making a cake from scratch. My attempt turned out pretty well despite my missteps. 1. I didn’t pay attention and only have two 9 inch pans instead of the three 6 inchers. I had to go on instinct for bake time (apparently I have good instincts). 2. I didn’t have plain coffee and ended up using a blueberry muffin flavored coffee. Because of this I did not make it a strong brew. 3. As I was putting the cakes in the oven I realized I had forgotten the vanilla in the batter. Despite all that, the family loved it. Next up, Butterbeer cake. Hi Kat! Lol! So glad it worked out despite all of those issues. It’s one of my favourites! I was also concerned about the raw flour. I did some research, and baked my cookie dough flour on a cookie sheet for 5 minutes while I baked the three cakes, since it’s recommended to toast the flour at this temperature. I didn’t notice a significant difference in flavor. Maybe you can attempt the cake by doing this too! I’ve never had an issue with raw flour myself, but if you’re concerned you can always bake the flour on a baking sheet for 5mins at 350F to kill any bacteria. You can get E.coli from any field grown produce (yes this does include flour) but no one is toasting their lettuce before putting it on a sandwich. So there’s no need to worry about this as it is a very minimal factor and even though it is possible it is very very unlikely. The recipe is very delicious and very creative and would totally be worth a little upset stomach if my flour contained some pathogens. Can this cake be made the day before? We are having a birthday party with a lot of food, so I’d like to start on the desserts the day before if possible! However, if it would taste better by being made the day of, then I will definitely do that! I’ve made this cake twice now for my chocolate-addict boyfriend and for a birthday party for some of our friends. Needless to say, I had many people coming back for multiple slices. My boyfriend took the cake from the party and put in back in the car before it was all gone so he could have the leftovers! Hi Hailey! Thank YOU for your sweet comment. I’m so glad you like this recipe and that you’ve made it multiple times :). Thanks so much Cristina! I LOVE that frosting too, so glad your husband liked it and Happy belated Birthday to him! Hi Olivia, It looks amazing. Can you use regular frosting or fondant instead of Ganache? I’m curious – when you pour the ganache over the top do you cover your cake stand with parchment or just let it drip onto the stand? Can we use this recipe for 3x 8 inch pans??? Hi Zee! Yes, but you should double the recipe. Hi! I love your blog, first of all. Everything you make is so cute and looks delicious! I had two questions because I really would like to make this for Christmas Eve at my house (my brother would love it.) 1. Will the cookie dough frosting work with toasted flour to prevent any E. Coli concerns? And 2. Can anything be subbed for the coffee in the recipie? I am “allergic” (it’s a migraine issue with smelling or having to much) I can use instant coffee grounds though, because they do not smell so strong. I love this recipe! I made it for my brother’s birthday and my whole family loved it. It was super easy to make but had that wow factor 🙂 my mom said it was “phenomenal”, we loved the cookie dough frosting! I made this cake for my husband’s bday, and it was delicious! I highly recommend giving it a shot. I doubled this recipe because I made it as a birthday cake for a friend… Amazing!!! Everyone raved about it. I am still hearing about how good the cake was and the party was about 5 days ago. Thank you for this amazing recipe. It is definitely a keeper! Hi Cassidy! I’m so glad you guys liked this recipe! It’s one of my faves :). Thanks for your comment! Can I just use normal milk instead of butter milk as I don’t don’t have any butter milk. Thanks! Hi Dolly! Do you have vinegar? If so you can make your own buttermilk by combining 1 cup of milk and 1 Tbsp of vinegar and letting it sit for 10mins or so (then only use 3/4 of that amount :)). You can try making the cake with regular milk, though I’m not sure there will be enough acid to activate the baking soda. It *should* be ok because the coffee is an acid too, I’ve just never tried it with regular milk. Let me know how it turns out! This looks absolutely delish ! Stumbled upon your site, quite by chance as I was on the hunt for the perfect cake for my soon to be thirteen year old. I just think I might have found it.Cannot wait to try this ! 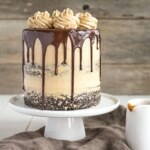 The chocolate cake looks amazing and I really want to try it except I loathe coffee!! Never developed the taste for it! Can I substitute something else for the coffee? Hi Regina! I totally get that. The coffee is just there to enhance the chocolate flavour, I swear you can’t taste it! But I’m a coffee lover so I might not be a good judge ;). You can just use hot water and leave the coffee out of it :). Quick question, since I’m making it a day in advance…how would you suggest storing it? Leave it out on the counter or put it in the fridge? Hello, I’m really interested in a cookie dough birthday cake.. And was enquiring whether it’s possible to get one if you bake for customers ? Hi Fiona! I’m super flattered that you asked!! I don’t bake for customers 😕. Maybe a local bakery can make something similar? It’s 1 and 1/2 stick butter, 1.5 cups flour, 3/4 cup brown sugar, 1/3 cup sugar, 2-3 tbs milk, vanilla, salt, choc chips. A bit different than yours. What do you think about the difference in ratios? I really appreciate your help! I want to make this for my husband for Fathers Day. Yours sounds great! I was just confused by the difference but I think it is based on cake size. Thank you for getting back to me. In going to make it tonight. Can’t wait!!!! OH! In that case I think you’ll have some frosting left over with mine but I just made some cookie dough truffles with the extra 😊. The cookie dough layer was awesome! I actually halved the recipe as I only made a 2 layer cake. It turned out great and I still had some extra ( which I have been nibbling on). Next time I make it I will add more frosting in between the cake layers. So yummy! Thank you!! Hi. I found a similar recipe to yours for the cookie dough part and she uses more butter, less milk and flour. How do you think it would affect the frosting? The website is eat drink love. Hi Jessica! It depends on the amounts but I don’t think it would have too huge an impact. If the frosting feels too thick you can always add more milk. I’m partial to this cookie dough recipe though 😊. This cake was the HIT of a birthday brunch today! The birthday girl loves chocolate, and cookie dough so it was a no brainer. Thanks for posting! Yay! So glad you liked it 🙂 Thanks!! Hello Olivia. I love, love, love all your postings and made several of your bundt recipes (always a hit) and now venturing into trying your three layer cakes because they are gorgeous. Last weekend I made the blue bear cake with my 12 year old granddaughter (an experience we will never forget) and we ended up using only two layers because they were so big and it was too high. What is the typical height of your 3 layer cakes? I have a lot of left over buttercream frosting that I froze and don’t know exactly how to re-use it. My question on this cake is about the hot coffee needed. I am not a coffee drinker but have espresso powder. Can I use that somehow? Or do you have an alternative solution. By the way when I go shopping for supplies at Sur La Table or Williams Sonoma I always show them your webpage on my phone and they all rave about it. A huge fan, Gloria … with a lot of questions! Hi Gloria! Thanks so much, you are so sweet!! The 3 layer cakes I make can be quite high… I haven’t ever measured, but I’d say they’re about 6″ tall? Typically I only use 6″ round cake pans, so the cakes are smaller and taller, but I like that look. All of the 6″ 3-layer recipes will work as 8″ 2-layer cakes too though. For this particular cake, the hot coffee helps bring out the flavour of the chocolate. I swear you can’t taste the coffee, but you can use just hot water if you prefer. You could also use the espresso powder and just dissolve it in the hot water :). Please let me know if you have any more questions! I’m so glad you love the Bundts and are venturing into cakes! Woohoo! Thank for getting back to me! I used 6″ pans and maybe different recipes might not puff up so high as the one for the blue bear cake… I did use the strips that you suggested as well. I love the look of the 6″ pans as well. 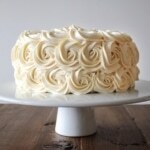 Can you tell me how to re-use buttercream? Do you just defrost and it’s ready to go; or do I have to do something special with it? Today I am trying your confetti bundt with red, white and blue sprinkles! You should have a TV show! The link to the cookie dough receipe called for 2 large eggs but in one of your comments you said “it was essentially cookie dough without the eggs” did you substitute something else for the eggs. I want to try this but have a phobia about feeing my family raw eggs. Hi Sandra! The cookie dough frosting is in the cake post. The cookie recipe I liked to is for the cookies that I baked and used as props for the pictures. The cookie dough frosting uses milk instead of eggs. Hi looks great, but I don’t see the recipe? Hi LeAnne! 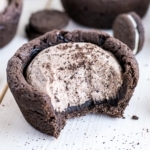 If you’re on mobile, you need to click the Read More to see the recipe. I made this cake for a friends birthday, it went down a treat! I replaced the coffee with hot water and reduced the sugar in the cake. Hi Sarah! If you think it’s too soft, just pop it in the fridge for a bit to firm up 😊. My frosting was stuff quite thick and harder to spread, but maybe your butter was softer than mine. Hello! I cannot wait to try this cake, I’m actually going to make it tonight. It looks amazing! I have a question, do you think this recipe will work using 2 8 or 9 inch pans instead of 3 6 inch pans? Hi Flor, I’m sorry, but I don’t understand your question :(. If I used 2 9 inch pans and only did 2 layers do you think it would still turn out ok or would the layers be too thin? Just saw the other comments… disregard! No worries! Two 9″ would work fine just slightly thinner layers :). I used the recipe for a birthday the other night. Hands down one of my favorite cake recipes, the frosting however solely tasted like raw flour so I opted for a traditional buttercream. Love that cake though thanks for the recipe! Hi Megan! The frosting tastes like raw cookie dough, which it essentially is. It’s not everyones cup of tea :). Glad you liked the cake recipe! Will this work if I use two 8″ pans? Or should I increase the recipe by a half..? I did not see the comment you just replied to…disregard this question haha! Hi Megan! No worries! Let me know how you like it 😄. This cake looks amazing! I want to try it for a Mother’s Day but am looking to make it in 9 inch pans. Would you recommend I just double the recipe and save a bit on the side? How much do u fill your pans up to typically? I know you mentioned it rises a bit… Thanks! I have a friend who did a naked cake as well the first time she hated it, but the second time she used acetate sheets and loved it. I gather you line a pan or plate with it in a tube shape and fill it with layers almost like a trifle bowl and then remove the sheets for that perfect image you want. Hi Kristina! I used that method once on the Momofuku cake I made, it was MUCH cleaner and prettier for sure. I found the acetate sheets to be more work though and I am lazy! Lol. I’m sure I’ll try that way again soon :). I have never made frosting with flour before. How is the taste compared to traditional frosting? Hi Birdy, the frosting is basically a cookie dough which is why it has flour in it. It tastes just like cookie dough :). Ok, this looks great! I do have one question though. The directions say to spray and powder the pan, and then put parchment paper down? Why would you do it this way? Or is it an “or” you can put paper down? Thank you! Hi Kim! I do both grease/flour and parchment to ensure the cakes come right out of the pans. It’s just an extra precaution :). This sounds very yummy. My son loves chocolate chip cookie dough so I think he would like this cake for his birthday. I know I am crazy but I do not like coffee. Can I substitute hot water for the coffee? Hi Evelyn! The coffee is just to intensify the chocolate flavour, I swear you can’t taste it! That being said, hot water should work just fine :). let me know how you like it! This looks just fabulous. Now to see if I can convert the recipe to english quantities I reckon I need to make this. So you use flour in the cookie dough filling and it is uncooked? Obv I have never eaten raw cookie dough ha ha. That is not correct. Raw flour can carry bacteria such as E. Coli and make people sick. The very young, very old, and immune-compromised are especially vulnerable. To avoid this, you can toast flour in your oven for 5 minutes before incorporating it into the recipe. Hi Dominique! I’ve never had issues with eating raw flour, but thank you for your tips! I love, love, love how this turned out! Truly! It looks great and I have no doubt that it is scrumptious! Hahahah I had the exact same problem with one of my layer cakes recently – it just did NOT want to sit straight, and was kind of curving out to the side. Luckily one side was much prettier so I took photos from there! Maybe skewers to stabilise it would have helped? 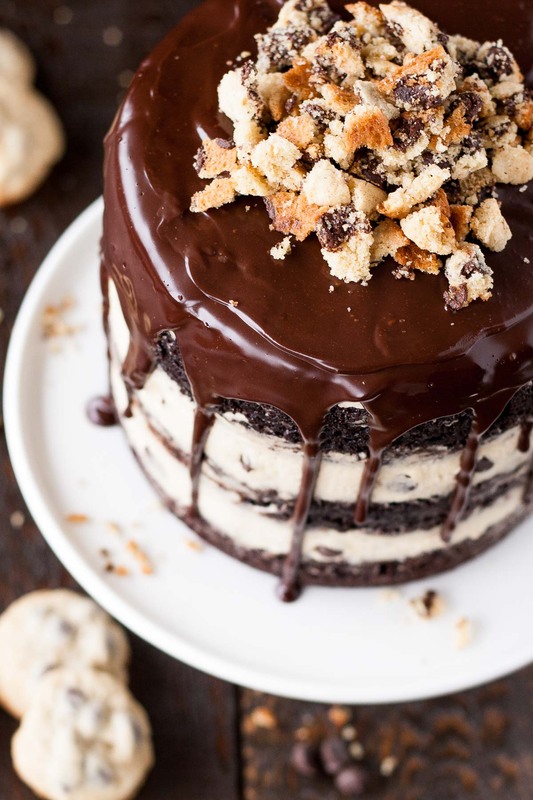 Love the idea of cookie dough frosting too – sounds incredibly decadent and so perfect with chocolate cake. 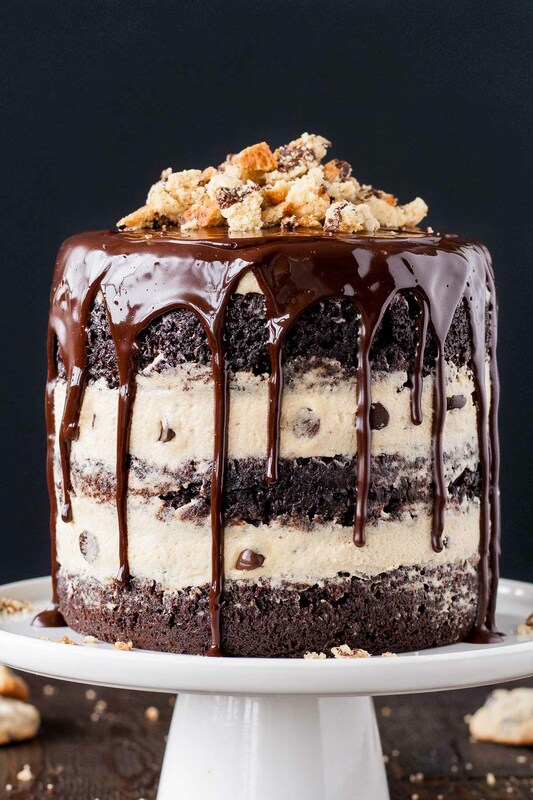 This cake looks sinfully delicious. I totally understand how you feel about it not turning out the way you wanted, but one of my favorite comments from a friend was that desserts shouldn’t look completely perfect because then they will look commercial, instead of homemade with love! I really want to make cupcakes using your recipe, how many cupcakes would this make and how long would you suggest baking them for? Hi Leah! You’re friend is so right — too much perfection does make it seem more manufactured :). For the cupcakes — it should make about 24 (the batter is very thin but rises a lot). I would recommend checking them at 20mins to see if they’re done. Let me know how they turn out! You ARE crazy, but that’s why we love you! 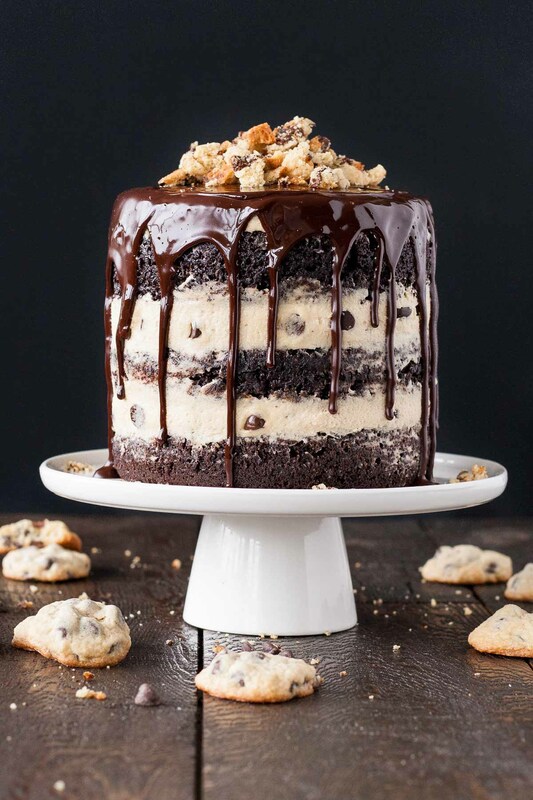 🙂 This cake makes all my chocolate-and-cookie-loving dreams come true. And I forgot to mention…that photo!! Gorgeous! 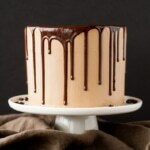 I tried to picture the look you were going for (with the cookie dough frosting top) but I love the way those dramatic chocolate drips look on the cake! Definitely going to make this. Great photos, btw! OMG Olivia! You must feel me rolling my eyes because…hello…This cake is AMAZING! My son Casey would adore it! He is a HUGE cookie dough fan. I am going to try to attempt this cake this year for his birthday in July. 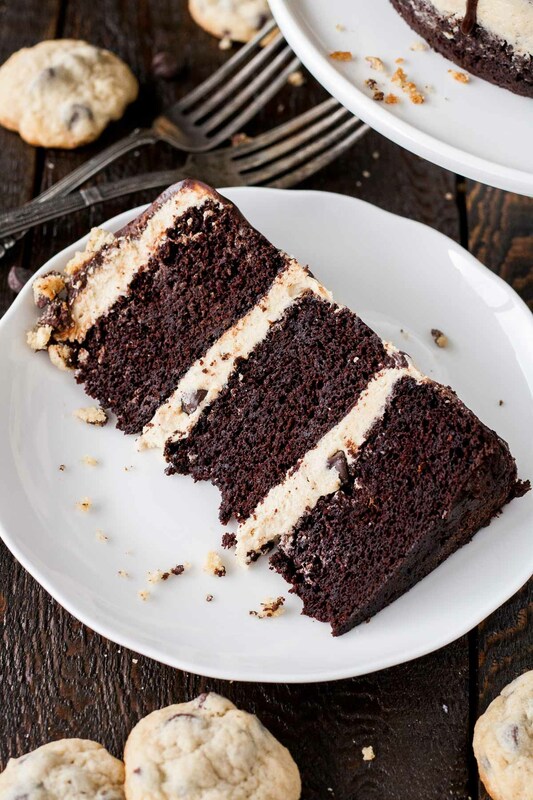 I’m sure mine will not even come near to yours, but I absolutely have to give it a go because it looks and sounds like layer cake perfection! Hi Sandy! Yes, you spread it between the layers like a frosting. Just curious.mthe frosting has all purpose flour. Will it not get someone have an upset stomach. Considering flour is not cooked or baked as part of the ingredients? Hi Clarissa! 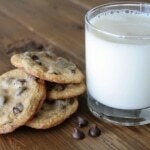 Flour doesn’t need to be cooked, it is safe to eat as part of the cookie dough (raw egg would be more of a concern). How do I get the cookie dough cake receipt? Hi Chrystine! The recipe is near the bottom of the post. If you’re on mobile you may need to click the Read More button.